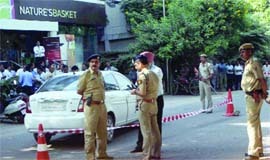 In a daring daylight robbery, armed assailants today escaped with a cash van carrying Rs 5.25 crore of a private bank after shooting at a guard. The incident happened in South Delhi's posh Defence Colony area. Six students at Delhi Technological University (DTU) have been offered a pay package of Rs 60 lakh by EPIC, a US-based software company. Even as students of Delhi University (DU) are troubled with the current revaluation system and its recent fee hike, the announcement of no revaluation system from next year has become a major concern for the student community. The New Delhi Municipal Council (NDMC) has launched an awareness campaign for the Resident Welfare Associations (RWAs) and Market Traders Associations (MTAs) on the issue of collection and disposal of electronic waste (e-waste) in environment friendly manner. Power supply to Peeragarhi relief camp in West Delhi was disconnected today by BSES Rajdhani Power Limited (BRPL), saying that the dues of the camp have gone above Rs 6.27 crore. An employee of a municipal corporation was crushed to death by a speeding truck that rammed into his bike from behind in Budh Vihar, this morning. The robbers, who were travelling in a Hyundai Verna car bearing a Haryana number plate, intercepted the van carrying cash to be deposited in an ATM. They dragged the four security guards out of the van, shot at one of them and drove away with the van. "When the police reached the spot, the guards-- Anil, Ajan, Ashok and Munna Singh-- were found there. Munna Singh had received a bullet injury and was writhing in pain. He was rushed to AIIMS Trauma Centre, where he has undergone an operation and is stable now," said a police official. Joint commissioner of police (South-West) Vivek Gogia said the incident took place around 1.45 pm. The police said the van belonged to ICICI Bank. However, bank officials have denied the claim, saying that the van belong to Premier Shield Private Limited, a cash replenishment agency that works for various banks. "The guards had collected the cash from Hauz Khas and were heading towards the D-Block market in Defence Colony when a Hyundai Verna car carrying four to five persons intercepted the van. Before the guards could understand anything, the robbers took out firearms and dragged the guards out of the van. One of the guards tried to raise the alarm and the robbers shot at him in the hand. The robbers then fled with both the vehicles," said the police official. "The car in which the robbers were travelling has been found to be stolen from Haryana. The cash van was later found abandoned at Bhagat Singh Park, near Max Hospital, Malviya Nagar, sans the cash," said the police official. The official said several teams had been formed to crack the case and raids are being conducted at several places. Six students at Delhi Technological University (DTU) have been offered a pay package of Rs 60 lakh by EPIC, a US-based software company. Four other students have been offered pay package of Rs 20 lakh from Directi (a Mumbai-based company). EPIC has offered pay package of $1, 05,000 (Rs 60 lakh, approximately) to Tanuj Mittal, Neha Das and Sumit Dugar who are IV-year students of Department of Software Engineering. Other three students are Meenal Bansal, IV-year student of Department of Information Technology, Akash Mittal, IV-year student of Department of Computer Engineering and Miland Kumar from Department of Computer Engineering. “The DTU academic session began on August 1 and 46 reputed companies have visited the university so far. DTU had started BTech in software engineering in 2009 and its students are being placed in international companies of high repute, said Dr. Ruchika Malhotra, Assistant Professor of the Department of Software Engineering. “DTU has a strong focus on industry relevance for its educational and research programmes. Our latest development of first solar car demonstrates our vision in action. The phenomenal rise in campus placements reflects the success of our programmes,” said Prof P.B. Sharma, Vice-Chancellor, DTU. “Other companies which have visited DTU include Facebook, Microsoft, Goldman Sachs, Maruti, Oracle, Google, Cisco, Brahmos Aerpspace, Motors, Indian Navy, C-Dot, TCS, Jindals Group, Mahindra, Honda, Bechtel, said Neeraj Nimwal, placement official, DTU. “A major highlight of this placement is that the leading companies, besides making job offers to the final-year students, are also offering paid internship to the III-year students,” he added. The main concern of the students is that fool-proofing result declaration mechanism in the university that is being used in over 70 colleges will be challenge in such a short span. The current process is clearly mismanaged. Not just that, most of the times, request for revaluation is not even acknowledged. Last week, a group of 22 students of BA in Lakshmibai College, who had failed to clear one paper in their III-year examination, accused the institute and Delhi University of not willing to re-check their answersheets or even listen to their case. Under the current system, if there is a difference of 5 per cent between the original and the revaluated marks, no change is made. In case the difference in between 5 and 10 per cent, average of the two is awarded. And if it is more than 10 per cent, the paper is reexamined and the average of the two highest marks amongst them is awarded. “Why am I being awarded averaged marks instead of what I actually secured? Why am I being penalised for the examiner’s mistake and why am I being charged for it? This is rubbish’’ said Promita Mukherjee, III-year student of economics. With the fee hike from the last month, some teachers allege that the system has now been reduced to a money-making gimmick. “Not only has the revaluation fee skyrocketed from Rs 250 per paper a few years ago to Rs 1,000 per paper in the present day, it also seems as if the papers have been deliberately marked less to possibly increase revenue from this source. Take for instance, the curious case of notoriously low marks in one of the economics II-year papers — Indian Economic Development (IED) — in the last semester. It is true that students were given grace marks in microeconomics on account of the horrifying paper but that in no way justifies the enormous scaling down that has happened in IED. This has led to most of the students applying for revaluation in this paper. Taking into account, the number of students currently pursuing this course in DU, the revenue that they would have generated from this is something that boggles the mind,” said a faculty member (economics) at Kirori Mal College, requesting anonymity. The administration on the other hand is assured that the new evaluation mechanism from the next year will leave no room for errors. “Under the new process, a fool-proof system will be followed where each paper will be evaluated by three teachers. The problems that the students currently face will not figure anywhere in the new system. It will be a more transparent system,” said a senior official at the examination branch. The NDMC has decided to provide e-bins for e-waste collection to all RWAs and MTAs. The civic agency has placed e-waste bins at the five different locations to collect from the nearby localities. It will be further disposed of by the authorised recycler, said an official of the NDMC. The council also planned to spread awareness about the correct disposal of e-waste so that people learn to drop them in such dedicated e-bins in future. "The basic idea is to encourage the members of the RWAs and MTAs for environment friendly e-waste disposal," he said. "The NDMC has already disposed of 7 ton of electronic waste collected from its various offices and schools and has received a certificate from authorised recycler. This certificate ensures that all the e-waste material disposed of from the NDMC has been processed in an environmental friendly manner in accordance with the guidelines of the Central Pollution Control Board," said the officials. The E-waste (Management and Handling) Rules were notified by the Central government in May 2011. As per the certain provision of these rules, it is the responsibility of the consumers to ensure that e-waste generated by them is channelised to authorised collection centre or registered dismantler or recyclers to curb environmental hazard. Over 1,500 inhabitants live in the camp, which was set-up for Punjab migrants in 1984. The camp is being provided electricity under the single point delivery (SPD) system and its cost was borne by the Revenue Department. “We have not received the payment towards the electricity dues for a long time. We have been deferring the disconnection on humanitarian grounds till now,” said an official of the BRPL. The official said that the government advised them to disconnect the connection except to the bonafide allotees. “We followed up the matter with the government at various levels. But they asked us to sanction electricity connections to only bonafide allotees as per the list to be provided by the Revenue Department and thereafter the SPD connection should be disconnected for the rest of the people by September 28. And the authorities haven’t been able to identify the bonafide allotees,” he said. According to the discom, they organised camps to identify the bonafide allotees but no one turned up. “We organised two camps for giving individual connections to the bonafide allotees on September 20 and 24, but not a single bonafide allottee came forward to take,” added the official.